CE Consulting Empresarial bets hard on an innovative project in advising companies and professionals by committing to their work and always offering the best service in the areas of legal advice, tax advice, accounting advice and employment advice. We currently have more than 140 business consultancies distributed throughout the national territory, being one of the leading business advising firms and consultancies in our country. More than 160 national and international offices offering tax, labor, accounting and legal advisory services. One of our offices will always be close to you. We are the leading consultancy network in Spain. Our brand is recognized, a complete guarantee for customers. 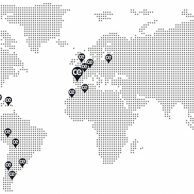 Our ambition to expand has led us to open consultancies in Europe, Asia, America and Africa.